"Celtics" redirects here. It is not to be confused with Celts, Gaels, Celtic F.C., or Gaelic (disambiguation). The Celtics have a notable rivalry with the Los Angeles Lakers, and have played the Lakers a record 12 times in the NBA Finals (including their most recent appearances in 2008 and 2010), of which the Celtics have won nine. Four Celtics players (Bob Cousy, Bill Russell, Dave Cowens and Larry Bird) have won the NBA Most Valuable Player Award for an NBA record total of 10 MVP awards. Both the nickname "Celtics" and their mascot "Lucky the Leprechaun" are a nod to Boston's historically large Irish population. Following the win in 2008, general manager Danny Ainge began a rebuilding process with the help of head coach Brad Stevens, who led the Celtics to a return to the playoffs from 2015. During the following season, the Celtics clinched the top seed in the Eastern Conference, but were eliminated in the Conference Finals by the Cleveland Cavaliers. This prompted an aggressive rebuild in 2017, where the team acquired All-Stars Kyrie Irving and Gordon Hayward. However, the pair struggled with injuries throughout the 2017–18 season, and the team was again defeated in the Eastern Conference Finals by the Cavaliers. Bill Russell starred on 11 NBA title teams in 13 years as a Celtic. With Bill Russell, the Celtics advanced to the 1957 NBA Finals and defeated the St. Louis Hawks in seven games, the first of a record 17 championships. Russell went on to win 11 championships, making him the most decorated player in NBA history. In 1958, the Celtics again advanced to the NBA Finals, this time losing to the Hawks in 6 games. However, with the acquisition of K.C. Jones that year, the Celtics began a dynasty that would last for more than a decade. In 1959, the Celtics won the NBA Championship after sweeping the Minneapolis Lakers, the first of their record eight consecutive championships. During that time, the Celtics met the Lakers in the Finals five times, starting an intense and often bitter rivalry that has spanned generations. In 1964, the Celtics became the first NBA team to have an all African-American starting lineup. On December 26, 1964, Willie Naulls replaced an injured Tommy Heinsohn, joining Tom 'Satch' Sanders, K.C. Jones, Sam Jones, and Bill Russell in the starting lineup. The Celtics defeated St. Louis 97–84. Boston won its next 11 games with Naulls starting in place of Heinsohn. The Celtics of the late 1950s–1960s are widely considered as one of the most dominant teams of all time. In 1978, owner Irv Levin traded his stake in the Celtics to John Y. Brown, Jr. for control of the Buffalo Braves, which he moved to California as the San Diego Clippers. As part of the deal, trades were made between the two franchises which resulted in many former Braves joining the Celtics. A move that irked Auerbach was a trade Brown made with the Braves that saw Buffalo's franchise center Bob McAdoo join the Celtics in return for three first round draft picks Auerbach had planned on using for rebuilding the Celtics. The dispute nearly led to him resigning as general manager for a similar position with the New York Knicks. 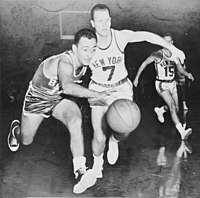 With public support strongly behind Auerbach, Brown sold the team to Harry Mangurian rather than run the risk of losing his famed general manager. The Celtics would struggle through the season, going 29–53 without Bird. Newcomers Chris Ford, Rick Robey, Cedric Maxwell and Nate Archibald failed to reverse the team's momentum. Bird debuted for the Celtics during the 1979–80 season. With a new owner in place, Auerbach made a number of moves that would bring the team back to prominence. He almost immediately traded McAdoo, a former NBA scoring champion, to the Detroit Pistons for guard M. L. Carr, a defensive specialist, and two first-round picks in the 1980 NBA draft. He also picked up point guard Gerald Henderson from the CBA. Carr, Archibald, Henderson and Ford formed a highly competent backcourt, blending in well with the talented frontcourt of Cowens, Maxwell and Bird. With Bird winning NBA Rookie of the Year honors the team went 61–21, a 32-game improvement from the previous season. Playing strong in the playoffs, the Celtics fell to the Philadelphia 76ers in the Eastern Conference Finals. Some thirty years later the Celtics broke their own single-season turnaround record. Following the 1981–82 NBA season, the Celtics once again met the Sixers, and fell behind 3–1 before losing Game 7 at Boston Garden. 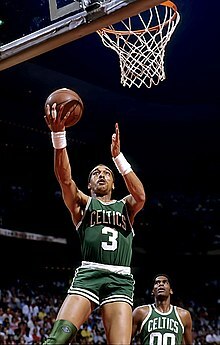 In 1983 the Celtics were swept in the playoffs for the first time by the Milwaukee Bucks; afterward, Fitch resigned and the team was sold to new owners led by Don Gaston. In 1983–84, the Celtics, under new coach K. C. Jones, would go 62–20 and return to the NBA Finals after a three-year hiatus. Boston came back from a 2–1 deficit to defeat the Lakers for their 15th championship. Bird renewed his college rivalry with Lakers star Magic Johnson during this series. After the season Auerbach officially retired as general manager but maintained the position of team president. He was succeeded by Jan Volk, who had been with the Celtics since graduating from Columbia Law School in 1971, serving as the team's General Counsel since 1976 and assistant general manager since 1980. In his first major transaction Volk made an off-season deal with the Seattle SuperSonics to send Henderson in return for their first round pick in the 1986 NBA draft. In 1985–86, the Celtics fielded one of the best teams in NBA history. The team went 67–15, winning all but one game at home. Bird won his third consecutive MVP award and Walton took home the Sixth Man of the Year Award. The Celtics defeated the Houston Rockets in the NBA Finals in six games, the franchise's 16th championship and last of the 20th century. In 1988, the Celtics lost in six games to the eventual champion Detroit Pistons in the Eastern Conference Finals. Following the season, head coach K.C. Jones retired and was replaced by assistant Jimmy Rodgers. Boston's hopes for 1988–89 faded when only 6 games into the season Larry Bird underwent a procedure to remove bone spurs in his feet. Bird did not play until after the All-Star break, and the Celtics won just 42 games before a first round playoff defeat to the Detroit Pistons, who would go on to win the championship. Bird returned in 1989–90 and led the Celtics to a 52–30 record. In the playoffs the Celtics collapsed after winning the first two games in a best-of-five series against the New York Knicks, losing 3 straight, including the decisive fifth game at Boston Garden. Rodgers was consequently fired and replaced by assistant coach and former Celtics' player Chris Ford. Under Ford's leadership, the Celtics improved to 56–26 in 1990–91, recapturing the Atlantic Division title even though Bird missed 22 games with several injuries. The Celtics again lost to the Detroit Pistons, this time in the Conference Semifinals. In 1992, a late season rally allowed a 51–31 Celtics team to catch the New York Knicks and repeat as Atlantic Division champions. After sweeping the Indiana Pacers in the first round, the Celtics lost a seven-game Eastern Conference Semifinals series to the Cleveland Cavaliers. Back injuries limited Bird to only 45 regular season games, and just four of ten in the playoffs. After thirteen NBA seasons and a gold medal at the Barcelona Olympics with the Dream Team, continued back trouble led Bird to retire in 1992. The loss of Bird and aging of the team's other veteran stars forced coach Chris Ford into rebuilding mode. Hopes centered on 26-year-old Reggie Lewis, a small forward out of Boston's Northeastern University. In the first round of the 1993 playoffs Lewis fainted during Boston's four-game sweep by the Charlotte Hornets. An examination revealed heart problems, but Lewis was able to get doctors to clear him for a comeback. Before he could make it he died of a heart attack while shooting baskets at Brandeis University during the off-season. The Celtics honored his memory by retiring his number 35. With Kevin McHale having retired after the Celtics' playoff loss to the Hornets, Boston's original Big 3 era came to an end in 1994 upon Robert Parish's signing with Charlotte. The team collapsed, finishing out of the playoffs with a 32–50 mark. Paul Pierce was drafted 10th overall in the 1998 NBA draft, going on to win the 2008 NBA Finals MVP award. The 2008–09 Celtics started off the season at 27–2, the then-best starting record in NBA history. They also had a pair of 10+ game winning streaks including a franchise record 19-game streak. After the All-Star Break, Kevin Garnett was injured in a loss against the Utah Jazz, missing the last 25 games of the season. Garnett was eventually shelved for the playoffs. The 2009 Celtics still finished with 62 victories, but their playoff run would end against the Magic in the second round, losing in seven games after leading 3–2, the first such occurrence in team history. In the prior round they were pushed to a Game 7 against the Chicago Bulls, with four of those games went to overtime, yet the Celtics' experience was too much for the young Bulls. At the 2011 NBA draft, the Celtics acquired two Purdue teammates, JaJuan Johnson and E'Twaun Moore. During the short preseason following the 2011 NBA lockout, the Celtics signed free agents Marquis Daniels, Chris Wilcox, Keyon Dooling and Greg Stiemsma, while acquiring Brandon Bass from the Magic for Glen Davis and Von Wafer. They also re-signed Jeff Green, only to have it voided after a physical revealed that Green was diagnosed with an aortic aneurysm, forcing him to miss the season. The Celtics started the season 0–3 with Paul Pierce out with a heel injury and his replacement Mickaël Piétrus taking long to debut. The struggles led to the longest losing streak in the "Big Three" era with five games, and by the All-Star break, the Celtics were below .500 with a 15–17 record. However, they were one of the hottest teams after the break, going 24–10 the rest of the year and winning their 5th division title in a row. The Celtics would end up making the playoffs as the fourth seed in the Eastern Conference in the 2012 NBA Playoffs. In the playoffs, the Celtics faced the Atlanta Hawks in the first round, beating them in six games led by strong play from Pierce and Garnett. In the Conference Semifinals the Celtics faced the Philadelphia 76ers led by Doug Collins and a young group of promising players that would push the Celtics into a seven-game series. Following a Game 7 85–75 win the Celtics faced the Miami Heat in the Eastern Conference Finals, who had defeated them in the playoffs the previous year. After losing the first two games in Miami, Boston fought back and won the next three games. 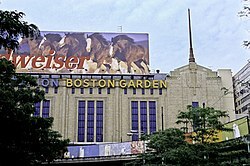 With the possibility of closing the series at home, the Celtics suffered a blowout loss at the TD Garden of 98–79, taking the series back to Miami for Game 7, where the Celtics built an early lead but eventually lost 101–88; Miami would go on to defeat the Oklahoma City Thunder in the Finals. The 2012 off-season started with the Celtics having only six players under contract. While Kevin Garnett renewed, Ray Allen chose to sign with the Miami Heat for less money, bringing the five-year "Big Three" era to a somewhat acrimonious end. 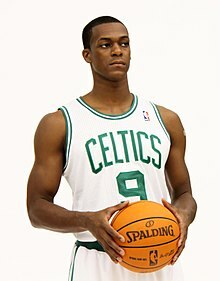 The Celtics also signed free agents Jason Terry, Jason Collins, Darko Miličić and Leandro Barbosa; acquired Courtney Lee in a three-team sign and trade – where Johnson, Moore, Sean Williams and a future second round pick were sent to the Houston Rockets and the Portland Trail Blazers got Sasha Pavlovic; drafted three players, Jared Sullinger, Fab Melo and Kris Joseph; and renewed with Brandon Bass along with Chris Wilcox and Jeff Green, who both were returning to play after sustaining season-ending heart ailments. During the off-season, head coach Doc Rivers was allowed out of his contract and left to coach the Los Angeles Clippers, giving the Celtics a 2015 unprotected first round pick as compensation. A few days later, Paul Pierce and Kevin Garnett (after waiving his no-trade clause), along with Jason Terry and D. J. White, were traded to the Brooklyn Nets for Keith Bogans, MarShon Brooks, Kris Humphries, Kris Joseph, Gerald Wallace, and three future first-round draft picks (2014, 2016, 2018), with the right to swap 2017 first-round picks with Brooklyn. The deal was later approved by the league on July 12, 2013, effectively ending the 'Big 3' era and marking the start of a youth movement for the team. By the end of the off-season, only 4 Celtics' players remained from the 2016–17 team, with Marcus Smart being the longest tenured Celtic from the 2014 NBA draft. On the team's opening night game in the first quarter against the Cavaliers, Hayward suffered a fractured tibia and dislocated ankle in his left leg, causing him to be ruled out for the rest of the regular season. Despite the loss, the Celtics went on a 16-game winning streak, which also went down as the fourth-longest winning streak in the teams' history. The streak started with a 102–92 victory over the Philadelphia 76ers on October 20 and ended on November 22 to the hands of the Miami Heat with a 98–104 loss. The Celtics finished the year with a 55–27 record, good enough for second place in the Eastern Conference. In the playoffs, they defeated the Milwaukee Bucks in the First Round in seven games, and continued the feat in the Conference Semifinals by defeating the Philadelphia 76ers in five games before losing to the Cleveland Cavaliers in seven games in the Conference Finals. The Boston Celtics were once rivals of the New Jersey Nets during the early 2000s due to their respective locations and their burgeoning stars. The Nets were led by Jason Kidd and Kenyon Martin, while the Celtics were experiencing newfound success behind Paul Pierce and Antoine Walker. The rivalry began to heat up in the 2002 Eastern Conference Finals, which was preceded by trash talking from the Celtics who claimed Martin was a "fake" tough guy. Things progressed as the series started, and on-court tensions seemed to spill into the stands. Celtics' fans berated Kidd and his family with chants of "Wife Beater!" in response to Kidd's 2001 domestic abuse charge. When asked about the fan barbs being traded, Kenyon Martin stated, "Our fans hate them, their fans hate us." Bill Walton said at the time that Nets-Celtics was the "beginning of the next great NBA rivalry" during the Eastern Conference Finals in 2002 with the Nets advancing to the NBA Finals, though New Jersey would go on to sweep Boston in the 2003 playoffs. In 2012, the year the Nets returned to New York in the borough of Brooklyn, there were indications that the rivalry might be rekindled when an altercation occurred on the court on November 28, resulting in the ejection of Rajon Rondo, Gerald Wallace, and Kris Humphries. Rondo was suspended for two games in the aftermath, while Wallace and Kevin Garnett were fined. The story was revisited on December 25, when Wallace grabbed Garnett's shorts and the two had to be broken up by referees and players alike. However, the rivalry between the Nets and the Celtics appeared significantly cooled off by the June 2013 blockbuster trade that dealt Celtics stars Garnett and Paul Pierce to the Nets in exchange for Wallace, Humphries, and others. This move was billed as a merger of the two Atlantic Division teams. Celtics announcer Sean Grande said "It's almost as if you found a great home for these guys. You couldn't have found a better place. These guys will be in the New York market, they'll be on a competitive team, they'll stay on national TV. It's funny, because the enemy of my enemy is my friend. So with Celtics fans feeling the way they do about the Heat, feeling the way they do about the Knicks, the Nets are going to become almost the second [Boston] team now." The trade would end up crippling the Nets who posted a record of 151–259 following the trade including three consecutive seasons with fewer than 30 wins from 2016 to 2018. Brooklyn would win just one playoff series with Garnett and Pierce, neither of whom were with the team by the close of the 2014–2015 season. The Celtics would use Brooklyn's draft picks to acquire Jaylen Brown and Jayson Tatum through the draft in 2016 and 2017 respectively and Kyrie Irving via trade, en route to consecutive appearances in the Eastern Conference Finals in 2017 and 2018. The rivalry had been less intense since the retirements of Magic Johnson and Larry Bird in the early 1990s, but in 2008 it was renewed as the Celtics and Lakers met in the Finals for the first time since 1987, with the Celtics winning the series in six games. They faced off once again in the 2010 NBA Finals which the Lakers won in seven games. The two teams have won the two highest numbers of championships, the Celtics 17, the Lakers 16; together, the 33 championships account for almost half of the 72 championships in NBA history. The Celtics and the Philadelphia 76ers are the two teams who have the most meetings in the NBA Playoffs, playing each other in 19 series, of which the Celtics have won 12. The 76ers are considered as the Celtics' biggest rival in the Eastern Conference. The rivalry reached its peak when players Bill Russell and Wilt Chamberlain of the 76ers played each other from 1965 to 1968. Their play would result in the Celtics not winning every NBA Finals series in the 1960s when the Sixers won in 1967. The most recent and unexpected rivalry that has been created between the Celtics is with the Washington Wizards. Although both teams had engaged in a fight in 1984, the rivalry intensified during the 2015–16 season in a January regular season game after Jae Crowder was given a technical foul. Crowder then began to exchange words with then Wizards coach Randy Wittman. It began to escalate that off-season when the Celtics were trying to sign Al Horford. It was publicly reported that Jae Crowder emphasized that the Celtics beat the Wizards in all of their meetings that season and should sign with them rather than Washington. In their first meeting of the 2016–17 season, Wall hit Marcus Smart in the back-court when they were up by 20 late in the 4th quarter. Wall was hit with a Flagrant 2 foul and was promptly ejected. Smart immediately got back up and began to scuffle with Wall. Their words continued even after being separated with Wall telling Smart to meet him out back after the game. No incident was reported between the two following the game. In their next meeting, the Celtics won 117–108. However, after the game Wall and Crowder exchanged words in front of the Wizards bench. Crowder ended up trying to jab his finger at Wall's nose and Wall tried to fight back with a slap. Teammates and coaches from both sides had to step in and separate the two teams but the players continued to yell while entering their respective locker rooms. Police officers had to be on guard between the two locker rooms to ensure no further confrontation. Otto Porter is quoted as calling the Celtics as dirty. Isaiah Thomas replied "If playing hard is dirty, then I guess we are a dirty team." In their next game in January, the Wizards wore all black to enter the game. The notion was that it is similar to the attire of a funeral. Their decision worked as they defeated the Celtics 123–108. The two teams would go on to meet in the Conference Semifinals in the 2017 Playoffs. In Game 1, Markieff Morris landed on Horford's ankle after shooting a jumpshot. Morris sprained his ankle and had to miss the rest of the game which was a 123–111 loss. Morris believed that Horford did this intentionally. In Game 2, Morris retaliated by grabbing Horford by the waist and pushed him into the seats. In Game 3, Kelly Olynyk set a hard screen on Kelly Oubre. Olynyk's shoulder hit Oubre in the chin causing him to drop to the floor. Oubre angrily rose and pushed Olynyk down onto the floor. Oubre was then assessed a flagrant 2 foul and was ejected while also being suspended for Game 4. No significant altercations erupted in the rest of the seven game series in which the Celtics would go on to win. The rivalry has since dissipated as the Celtics have retooled their roster but their match-ups are still seen as significant as they played on Christmas in 2017. The Celtics have an NBA record 17 Championships including 8 in a row, and 11 championships in 13 years. They also have 52 playoff appearances. The Naismith Memorial Basketball Hall of Fame have 45 enshrined players who played for the Celtics, and the franchise has retired 22 jersey numbers, more than any other American sports team. FIBA, the body which governs international basketball, has selected two players associated with the Celtics to the FIBA Hall of Fame for contributions to international basketball. 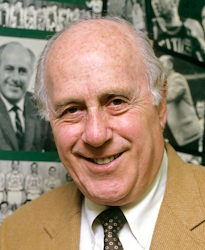 Red Auerbach coached the Boston Celtics to 9 NBA titles, with eight straight between 1959 and 1966. Starting with the 2017–18 season, the Celtics wore special edition "City" uniforms designed by Nike. Their first "City" uniforms were in gray and featured a pattern of the parquet floor throughout, a green shamrock with white trim on the left leg, green letters with white trim, Red Auerbach's signature near the uniform tag, and a portion of the 2008 championship banner on the beltline. For the 2018–19 season, the Celtics wore white "City" uniforms with green letters and shamrocks trimmed in gold. It also has Red Auerbach's signature near the uniform tag and a gold-trimmed alternate Celtics logo on the beltline. In addition, the Celtics wore an "Earned" edition uniform exclusive only to the 16 teams that made the 2018 NBA Playoffs. Their rendition is a palette swap of the "City" uniforms with a green base and gold letters and shamrocks with white trim. The team has honored deceased members of the Celtics family with a commemorative black band on the left shoulder strap of the jersey. It has been featured eight times in the history of the franchise: Walter Brown (1964–65), Bob Schmertz (1975–76), Joan Cohen (1989–90), Johnny Most and Reggie Lewis (1993–94), Dorothy Auerbach (2000–01), Dennis Johnson (2006–07), Jim Loscutoff (2015–16) and Jo Jo White (2017–18). The Celtics also wore a black band for reasons not related to the franchise, such as the Boston Marathon bombing in 2013, and the death of Isaiah Thomas' younger sister during the 2017 NBA Playoffs. Mike Gorman provides the play-by-play with former Celtics player and coach Tommy Heinsohn serving as analyst for home games, while former Celtics' player Brian Scalabrine serves as analyst for road games. Abby Chin serves as courtside reporter. All Celtics games are heard on radio through Beasley Broadcast Group's WBZ-FM (98.5, otherwise branded as "The Sports Hub"), with play-by-play from Sean Grande and color commentary from Cedric Maxwell, a deal in place since the 2013–14 season. ^ a b "Creation of a Logo". Celtics.com. NBA Media Ventures, LLC. Retrieved March 4, 2018. ^ a b c Snow, Taylor C. (September 21, 2017). "Celtics Showcase New Nike Uniform System". Celtics.com. NBA Media Ventures, LLC. Retrieved November 26, 2017. ^ a b "Celtics, GE Announce Multi-Year Partnership". Celtics.com (Press release). NBA Media Ventures, LLC. January 25, 2017. Retrieved December 17, 2017. ^ "Celtics vs. Lakers: An epic NBA finals rivalry". NBC Sports. June 1, 2010. Retrieved February 14, 2019. ^ "What's in a Name?". Celtics.com. NBA Media Ventures, LLC. August 24, 2012. Retrieved July 26, 2015. ^ "2017 Offseason In Review: Boston Celtics". Hoops Rumors. Retrieved October 19, 2018. ^ "Celtics Related Books". Celtics.com. NBA Media Ventures, LLC. Retrieved October 21, 2018. ^ ., Retrieved November 2, 2014. ^ Berube, Reagan. "High Five". Celtics.com. NBA Media Ventures, LLC. Retrieved October 21, 2018. ^ "Unbreakable" Sports Records (The World Almanac) Archived August 2, 2009, at the Wayback Machine worldalmanac.com. Retrieved April 13, 2007. ^ Bucks NBA Archived December 16, 2008, at the Wayback Machine, jsonline.com. Retrieved April 16, 2005. ^ Oklahoma Sooners Official Athletic Site — Men's Basketball Archived February 15, 2008, at the Wayback Machine, soonersports.com. Retrieved February 17, 2008. ^ "ESPN.com: NBA – Celtics, Braves once made a really big trade". assets.espn.go.com. Retrieved October 18, 2017. ^ Boston Celtics History Archived October 26, 2012, at the Wayback Machine, nba.com. Retrieved February 10, 2008. ^ a b c Red Auerbach Biography Archived February 18, 2012, at WebCite, jockbio.com. Retrieved December 10, 2010. ^ "Villanova to Retire Former Celtic Player, Coach Chris Ford's Jersey". Celtics.com. NBA Media Ventures, LLC. January 30, 2006. Retrieved October 21, 2018. ^ "Remembering Reggie... – The Official Site of the BOSTON CELTICS". Retrieved June 30, 2015. ^ Citizens Bank Closes Deal with Rick Pitino Celtics Head Coach Signs on With Personal Services Contract[dead link], highbeam.com December 9, 1997. Retrieved December 15, 1997. ^ Berkow, Ira (November 2, 1997). "ON BASKETBALL; Pitino's Young Guns Overrun The Bulls". Retrieved October 18, 2017 – via www.nytimes.com. ^ Celtics, Boston. "Boston Celtics History – Celtics.com – The official website of the Boston Celtics". www.nba.com. Archived from the original on October 26, 2012. Retrieved October 18, 2017. ^ "Boston Wins Without Pitino". Retrieved October 18, 2017. ^ Wise, Mike (February 19, 1998). "BASKETBALL; Kenny Anderson Is Traded To Celtics in 7-Player Deal". Retrieved October 18, 2017 – via www.nytimes.com. ^ "Philippine Daily Inquirer – Google News Archive Search". news.google.com. Retrieved October 18, 2017. ^ 2002 NBA Playoffs Archived September 22, 2013, at the Wayback Machine, basketball-reference.com. Retrieved August 4, 2003. ^ Celtics Acquire Seven-Time All-Star Ray Allen from Sonics Archived February 18, 2012, at WebCite, nba.com. Retrieved July 12, 2007. ^ Zillgitt, Jeff (May 28, 2010). "Celtics finally finish off Magic in Game 6 to head back to Finals". USA Today. Retrieved May 29, 2010. ^ "Celtics Sign D.J. White". Retrieved June 30, 2015. ^ "Shavlik Randolph Signs 10-Day Contract With Celtics – RealGM Wiretap". Retrieved June 30, 2015. ^ Ben Golliver. "NBA cancels game between Celtics and Pacers after Boston Marathon blasts". SI.com. Archived from the original on February 22, 2014. Retrieved June 30, 2015. ^ "Knicks vs. Celtics – Game Recap – May 3, 2013 – ESPN". ESPN.com. Retrieved October 18, 2017. ^ a b "Celtics Hire Brad Stevens as Head Coach". Retrieved June 30, 2015. ^ "NBA's big three miss playoffs in same year for first time". Retrieved October 18, 2017. ^ "What can the Celtics do with the sixth pick?". CBS Sports. CBS. Retrieved June 10, 2014. ^ "Boston Celtics Complete Trade With Dallas Mavericks". Boston Celtics. Retrieved June 30, 2015. ^ "Roster overhaul hasn't changed C's goals". Retrieved October 18, 2017. ^ "Jared Sullinger of Boston Celtics will miss rest of season due to foot injury". ESPN.com. Retrieved June 30, 2015. ^ "The Celtics Will Probably Miss the Playoffs, and That's Okay". Retrieved October 18, 2017. ^ "Now in playoffs, Isaiah Thomas has discovered the Boston Celtics are not one of the NBA's worst teams". Retrieved October 18, 2017. ^ "Celtics Clinch #1 Seed; Will Face Bulls In First Round". Retrieved April 20, 2017. ^ Polacek, Scott. "Isaiah Thomas out for Rest of 2017 NBA Postseason with Hip Injury". Retrieved October 18, 2017. ^ Boston Celtics Franchise History, nba.com. Retrieved November 8, 2012. ^ "Celtics-Pistons Top 10 games". ESPN.com. May 28, 2008. Retrieved October 18, 2017. ^ "How Celtics-Wizards became the NBA's most unexpected rivalry". ESPN.com. Retrieved April 2, 2018. ^ Buckner, Candace (December 24, 2017). "Things change, but NBA hopes Wizards-Celtics rivalry still brings Christmas magic". Washington Post. ISSN 0190-8286. Retrieved April 2, 2018. ^ Dodson, Aaron (May 5, 2017). "Kelly Oubre Jr. vs. Kelly Olynyk: In the battle of the Kellys, Twitter stood by Oubre Jr". The Undefeated. Retrieved April 2, 2018. ^ "Celtics Hall of Famers". NBA.com. Retrieved February 8, 2012. ^ "Retired Numbers – Celtics". NBA.com. Retrieved February 8, 2012. ^ AP (October 10, 1963). "Celtics Vow To Be Champions". Gadsden Times. Retrieved June 3, 2012. ^ AP (January 16, 1967). "Havlicek Celtic Captain". The Day. Retrieved June 3, 2012. ^ UPI (October 12, 1978). "White, Cowens captains; Maxwell to start Friday". Bangor Daily News. Retrieved June 3, 2012. ^ UPI (February 1, 1979). "Celtics Defuse Rockets". The Telegraph. Retrieved June 3, 2012. ^ "Cowens Calls It Quits". The Daily Union Democrat. October 2, 1980. Retrieved June 3, 2012. ^ UPI (October 28, 1983). "Talented, ambitious Celtics in opener at Detroit tonight". Bangor Daily News. Retrieved June 3, 2012. ^ a b AP (October 14, 1992). "Celtics name Lewis captain". Bangor Daily News. Retrieved June 3, 2012. ^ Hohman, Ralph (October 31, 1993). "Celtics wish for a new star". Record-Journal. Retrieved June 3, 2012. ^ AP (November 2, 1994). "Brown, Wilkins appointed as co-captains for Celtics". Sun Journal. Retrieved June 3, 2012. ^ AP (October 11, 1995). "High Hopes at Celts' Camp". The Hour. Retrieved June 3, 2012. ^ The Associated Press (November 28, 1996). "Magic Edge Hawks". Gainesville Sun. Retrieved June 3, 2012. ^ a b AP (December 3, 1997). "Pitino names Ellison captain". Sun Journal. Retrieved June 3, 2012. ^ "C's Name Rondo Captain On Night of Return". Retrieved June 30, 2015. ^ a b "Boston Celtics: Players". Basketball Reference. April 18, 2017. Retrieved April 18, 2017. ^ Efraim, Aviv. "Boston Celtics Logo". www.symbols.com. Retrieved October 19, 2018. 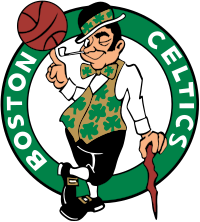 ^ "Boston Celtics Announce New Alternate Logo". Celtics.com (Press release). NBA Media Ventures, LLC. July 21, 2014. Retrieved July 26, 2015. ^ "Celtics x Nike". Celtics.com. NBA Media Ventures, LLC. September 21, 2017. Archived from the original on December 18, 2017. Retrieved November 10, 2018. ^ Sutherland, Brooke (March 22, 2018). "GE's Nickel-and-Diming Included a Payroll Switch". Bloomberg News. Retrieved March 23, 2018. ^ "Boston Celtics Unveil New Alternate Road Uniforms". Celtics.com (Press release). NBA Media Ventures, LLC. November 21, 2005. Retrieved November 19, 2017. ^ "Boston Celtics and adidas Unveil Parquet Pride Collection". Celtics.com (Press release). NBA Media Ventures, LLC. November 6, 2014. Retrieved July 26, 2015. ^ "Boston Celtics Unveil Special St. Patrick's Uniforms". Celtics.com (Press release). NBA Media Ventures, LLC. March 6, 2006. Retrieved November 19, 2017. ^ Boston Celtics [@celtics] (November 9, 2018). "Tradition redefined. Say hello to our 2018-19 City Edition" (Tweet) – via Twitter. ^ NBA.com Staff (November 9, 2018). "City Edition uniforms: Eastern Conference teams in 2018-19". NBA.com. NBA Media Ventures, LLC. Retrieved November 10, 2018. The Celtics kept up with their storied tradition in their City Edition uniforms. The new look features as signature from Red Auerbach stitched into the jersey. The jerseys also feature Nike+ Connect, the traditional "BOSTON" wordmark that debuted on road uniforms in the 1940s and colors of green, white and gold that are part of the franchise's roots. ^ NBA.com Staff (December 12, 2018). "Teams unveil Earned Edition uniforms for 2018-19 season". NBA.com. NBA Media Ventures, LLC. Retrieved December 12, 2018. ^ "Celtics, 98.5 The Sports Hub Announce Multi-Year Broadcast Partnership « CBS Boston". Boston.cbslocal.com. September 26, 2013. Retrieved October 25, 2013. ^ "New Owner But Red Is Still Boss of Celts". Lewiston Evening Journal. January 14, 1975. Retrieved March 14, 2010. ^ "Celtics' owner dispute is more confused than ever". The Tuscaloosa News. July 22, 1974. Retrieved March 14, 2010.